The influence of the high frequency trading never ceases to amaze us. Every time a finger is pointed at them, they usually roll out the big guns to quickly squash the issue. Most of the time they roll out an academic to point out that HFT “adds liquidity and shrinks spreads”. But this tactic has run into a problem with the revelation that some academics are having their research sponsored by HFT firms. Now, it appears the HFT lobby has turned to the stock and commodity exchanges to do their dirty work for them. “As you might expect, a number of customers of our client CME Group, Inc. have expressed their concern that … data has been shared with non-Commission employees,” said the letter, which was written by Skadden Arps attorneys Mark Young and Jerrold Salzman on CME’s behalf. 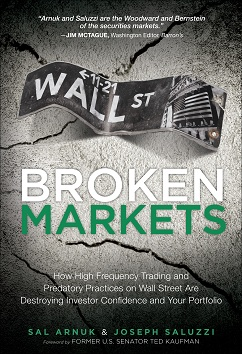 “Two of the best pieces of research on high frequency trading that we have read recently are Andrei Kirilenko’s “The Trading Profits of High Frequency Traders” and Adam Clark-Joseph’s ”Exploratory Trading” . These two pieces of research are special because they use actual transaction level data from the CME and traced back to the original source of the trade. Most of the rest of the HFT research reports out there rely on a sample set of data usually supplied by an exchange. It doesn’t sound like any information was leaked. We read and reviewed the reports in question and no information about client identities was revealed. Clients were bunched into categories but not named. So, what is the CME afraid of? Are they afraid that if more research is done that it might expose nefarious trading practices from some of their highest volume clients? Shouldn’t an exchange encourage this type of research in order to make sure the public is being treated fairly? Sure sounds like another conflict of interest has emerged at a for profit exchange.